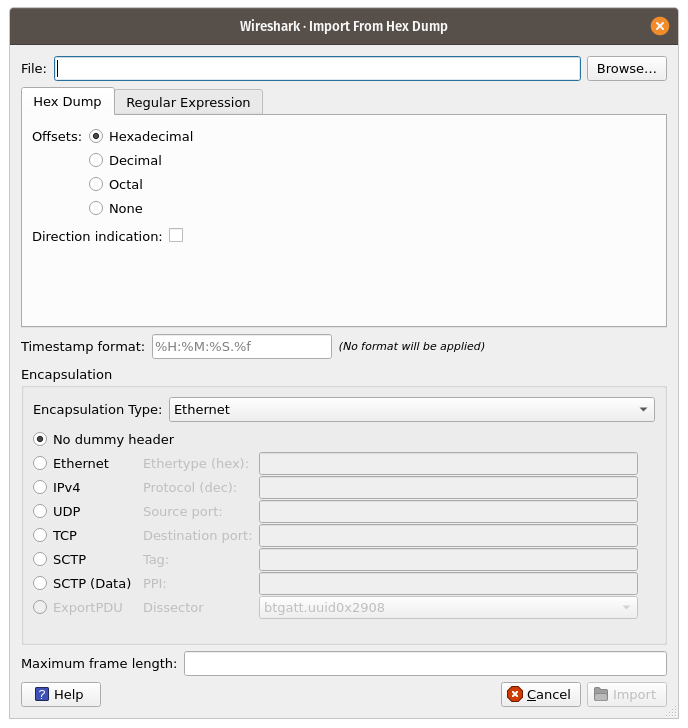 Wireshark can read in an ASCII hex dump and write the data described into a temporary libpcap capture file. It can read hex dumps with multiple packets in them, and build a capture file of multiple packets. It is also capable of generating dummy Ethernet, IP and UDP, TCP, or SCTP headers, in order to build fully processable packet dumps from hexdumps of application-level data only. There are a couple of other special features to note. Any line where the first non-whitespace character is # will be ignored as a comment. Any line beginning with #TEXT2PCAP is a directive and options can be inserted after this command to be processed by Wireshark. Currently there are no directives implemented. In the future these may be used to give more fine grained control on the dump and the way it should be processed e.g. timestamps, encapsulation type etc. Wireshark also allows the user to read in dumps of application-level data, by inserting dummy L2, L3 and L4 headers before each packet. The user can elect to insert Ethernet headers, Ethernet and IP, or Ethernet, IP and UDP/TCP/SCTP headers before each packet. This allows Wireshark or any other full-packet decoder to handle these dumps. This dialog box lets you select a text file, containing a hex dump of packet data, to be imported and set import parameters. Determine which input file has to be imported and how it is to be interpreted. Determine how the data is to be encapsulated. Enter the name of the text file to import. You can use Browse to browse for a file. Select the radix of the offsets given in the text file to import. This is usually hexadecimal, but decimal and octal are also supported. Select None when only the bytes are present. These will be imported as a single packet. This is the format specifier used to parse the timestamps in the text file to import. It uses a simple syntax to describe the format of the timestamps, using %H for hours, %M for minutes, %S for seconds, etc. The straightforward HH:MM:SS format is covered by %T. For a full definition of the syntax look for strptime(3). If there are no timestamps in the text file to import leave this field empty and timestamps will be generated based on the time of import. Tick this box if the text file to import has direction indicators before each frame. These are on a separate line before each frame and start with either I or i for input and O or o for output. Here you can select which type of frames you are importing. This all depends on from what type of medium the dump to import was taken. It lists all types that Wireshark understands, so as to pass the capture file contents to the right dissector. When Ethernet encapsulation is selected you have to option to prepend dummy headers to the frames to import. These headers can provide artificial Ethernet, IP, UDP, TCP or SCTP headers or SCTP data chunks. When selecting a type of dummy header the applicable entries are enabled, others are grayed out and default values are used. When the Wireshark Upper PDU export encapsulation is selected the option ExportPDU becomes available. This allows you to enter the name of the dissector these frames are to be directed to. You may not be interested in the full frames from the text file, just the first part. Here you can define how much data from the start of the frame you want to import. If you leave this open the maximum is set to 256kiB. Once all input and import parameters are setup click Import to start the import. If your current data wasn’t saved before you will be asked to save it first. When completed there will be a new capture file loaded with the frames imported from the text file.